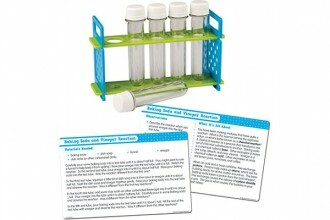 The Test Tube and Activity Card Set includes hands-on activities that encourage experimentation, observation and analysis. The set includes five durable, plastic test tubes with five leak-proof screw caps. Five double-sided activity cards feature simple science experiments that are easy to adapt for multiple grade levels.